While the look of arcade cabinets has changed over the years, the general makeup of the parts has remained basically the same. For those of you who are new to arcade game collecting, you might not be familiar with the general terms that are used relatively frequently for these parts. The diagram above is of a classic Mario Bros cabinet. You can click on this diagram if you would like to see a larger version of this image. We will be using this diagram to identify these parts. You will find a brief description of each part below. Marquee: A piece of plastic or glass which has the arcade game name and related artwork printed on it. It is typically located on the top of the game and is usually backlit by a florescent light. T-Molding: Flexible, plastic trim that covers the leading wood edges of an arcade cabinet. While a simple black t-molding is used on most games, t-molding is available in many colors including orange (found on Pac Man cabinets), white (found on Donkey Kong cabinets) and chrome. Bezel: A piece of cardboard or plastic that surrounds the monitor. This can also refer to a glass or plastic item that covers the monitor. Bezels usually contain artwork relating to the game. Other names include monitor glass and monitor shroud. Monitor: The screen that is used for viewing the game play of an arcade game. It is typically a combination of a CRT (Cathode Ray (Picture) Tube) and a chassis (a PCB (Printed Circuit Board) that powers a CRT). The most common monitor sizes are 19″, 25″, and 33″. Sideart: Artwork located on the side and/or front of an arcade cabinet. It can either be a large sticker or artwork that has been directly painted on the cabinet. Control Panel: The panel that houses the main controls for the arcade game. Some of these controls include joysticks, trackballs, and buttons. Older games typically have a big sticker known as a CPO (Control Panel Overlay) that contains artwork and instructions related to the game. Speaker (Grill): The object that produces sound for an arcade game. 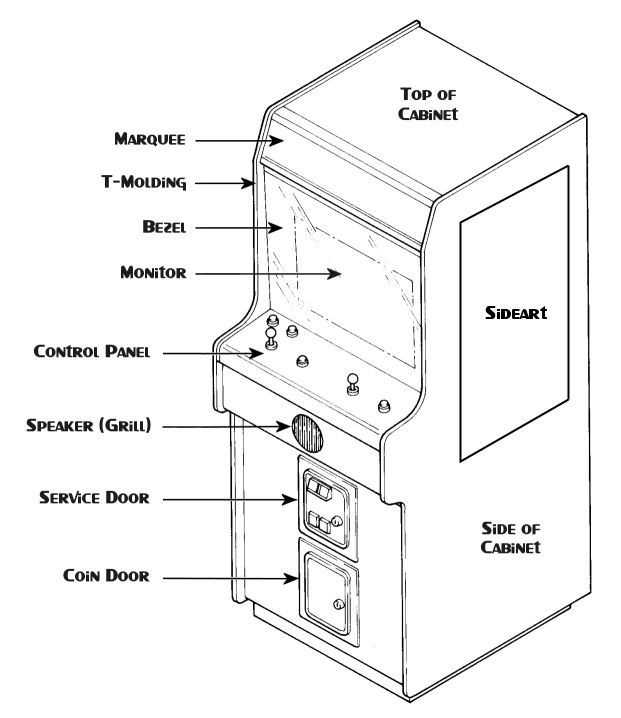 Arcade cabinets typically have speaker grills that designate where the speaker is in relation to the cabinet. Service Door: The metal door (usually black) on the front of the cabinet that accepts coins for game play. It is made up of lights that illuminate the price of the game and a coin mechanism that is designed to verify the right coins are being inserted. Coin Door: The metal door (usually black) on the front of the cabinet that contains a bucket where the coins get stored until pulled by the operator. Some people refer to both the service door and the coin door as the coin door collectively. Now that you know the major parts of an arcade cabinet, you should be able to more effectively communicate the part of that special game you need. Good luck in restoring your arcade cabinets in the future. Figure out what's wrong with your arcade controls. Learn tips to repair power supply and wiring issues. Discover ways to make your arcade look like new. Find out if your game is having board issues. Identify and solve problems with your arcade monitor. Tips about issues specifically related to pinball machines. Anything that doesn’t fit in another section. Listen to our podcast where we answer your questions. Watch our live show where we discuss arcade repair and more.